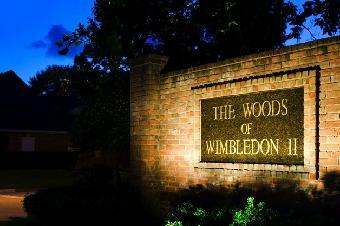 The Woods of Wimbledon II, known among the local residents as Woods II, is a small, pleasant neighborhood with consistent architectural designs, and lovely, well manicured lawns with tall trees. In the heart of the Champions Area just north of FM 1960, the 88 single family homes are close to excellent shopping and restaurants. Foresighted developer and main builder Bob Cabiness created this unique subdivision with traditional, complimentary brick houses. Soaring ceilings and open floor plans fill these custom built homes with natural light. The surrounding neighborhoods also contribute to the overall high end quality of the area. Woods II is located within the Klein ISD. There are several private schools nearby as well as three private golf clubs and numerous public golf courses.